I was having trouble with fields overlapping on one of my forms. On the third page, after selecting "no" on the "is this your permanent address?" question, the condition provides that it should show a secondary address box. When it pops up, it overlays on top of the initial address box, though. 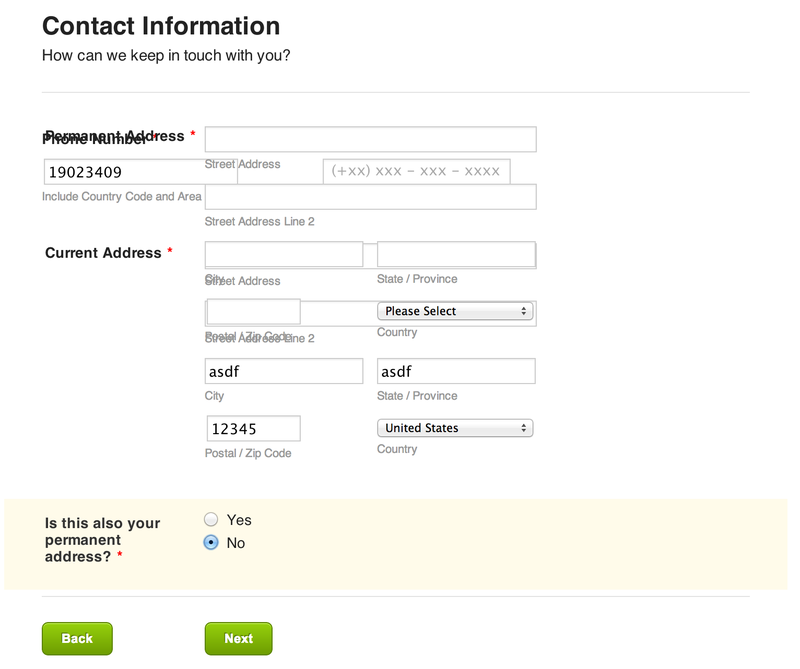 I've tried the steps mentioned on http://www.jotform.com/answers/50421-Fields-overlapping-in-Chrome to no avail. Is there any further troubleshooting I can try? You've added it incorrectly. It's not form-inline, it is form-line. Also, the form-line class doesn't have end block "}". This is what I see on your source currently. That should fixed it. Thanks! Whoops, my fault. Should have copied/pasted in the first place. Thanks for the help!